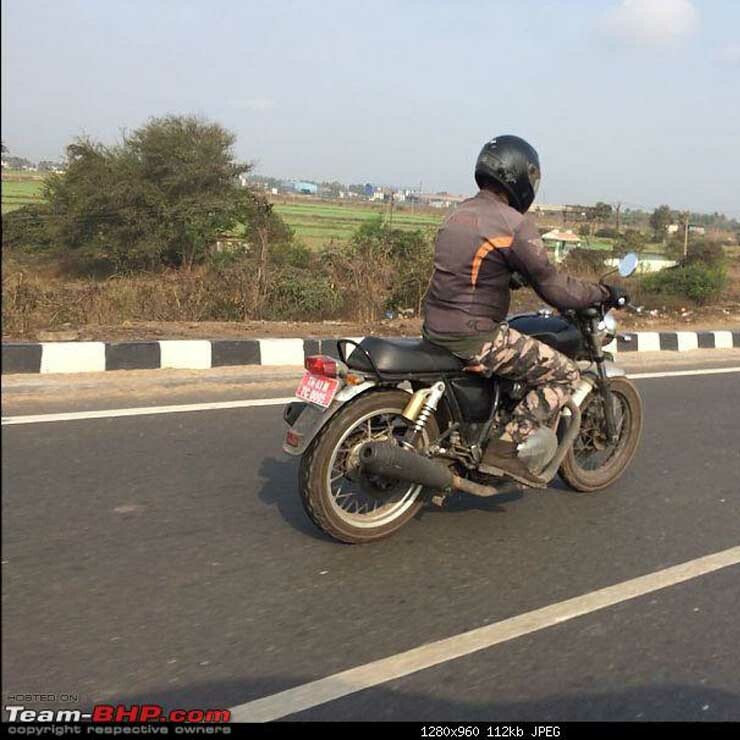 The upcoming Royal Enfield Interceptor INT 650 has been once again spotted testing in India. The upcoming motorcycle was unveiled at the 2017 EICMA and will likely launch in India in the second-quarter of 2018. Rumors abound that the launch of the new motorcycle will take place in April this year. The upcoming motorcycle will become the most powerful and the most expensive Royal Enfield model in the country. 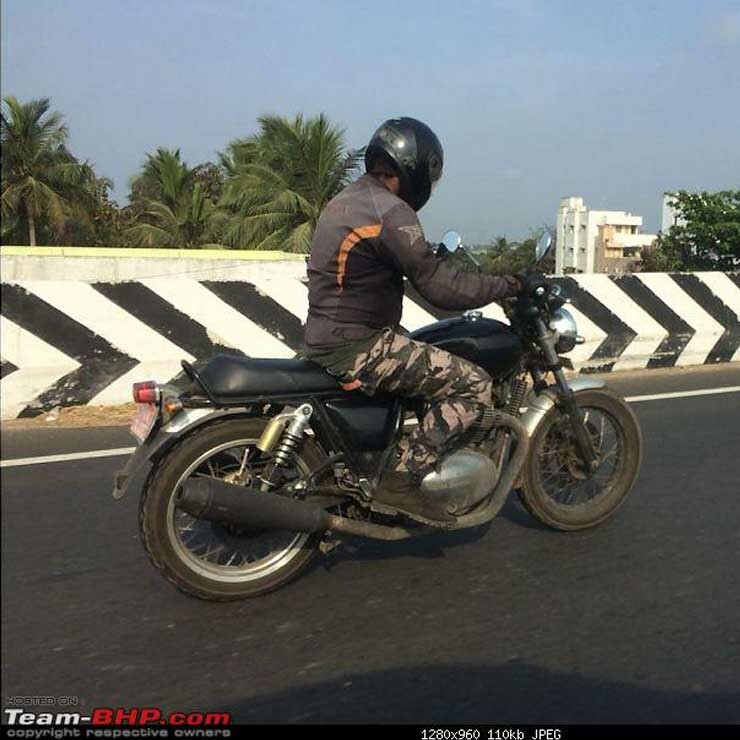 The test mule of the upcoming Royal Enfield Interceptor INT 650 was spotted testing on the Chennai Kolkata highway. The test mule can be seen sporting a pair of matte black exhaust pipes and black bodywork. The headlamp housing and the fenders have a chrome finish. Even the round rear view mirrors get chrome plating. Also, while the front spoke wheel has been painted black, the rear wheel seems to have been left untouched. The motorcycle offers a retro design that will likely have a wide acceptance. The upcoming Royal Enfield Interceptor INT 659 is powered by an all-new 648cc, SOHC, 4-valve, parallel twin engine that benefits from fuel injection and oil cooling. The engine has a 270-degree crank and features a balancer shaft to iron out the vibrations. The motor outputs a maximum power of 47 PS at 7,100 rpm along with a peak torque of 52 Nm at 4,000 rpm. The engine comes mated to an all-new 6-speed manual transmission that has a slip-assist clutch. The upcoming new motorcycle gets conventional telescopic forks up front and twin gas-charged shock absorbers at the rear. Braking is courtesy of 320 mm disc brake at the front and 240 mm disc brake at the rear. The motorcycle also gets ABS. The spoke wheels come shod with Pirelli Phantom Sportscomp tires that offer a high grip level. The upcoming Royal Enfield motorcycle is expected to cost less than Rs 4 lakh when it goes on sale here. Local production will be one of the biggest reasons for the aggressive price tag. There are good chances of the new motorcycle being launched alongside the new Continental GT 650. So, are you waiting for the India launch of the Royal Enfield Interceptor INT 650?